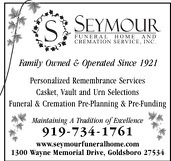 Seymour Funeral Home continues to be an innovative funeral service provider, continually updating staff, equipment, and facilities to better serve the families in our community. We also continue to be a leader in pre-arranged funerals, insurance and funeral service expansion, and we constantly seek new and better ways to provide efficient and cost-effective funeral service to the families we serve. Our goal is to make sure you truly are comforted and cared for by compassionate friends during your time of need. In doing so, we not only offer a variety of service options that we hope will exceed your expectations, but we are also committed to planning a funeral service that meets your needs. We offer a full-range of traditional, customized or special memorial and cremation services for all the families we serve. It's important for us to help you pay tribute with a more personalized approach to funeral services, which may not be limited to our equipment or chapel.